Containing many of the same health boosting sulpher compounds that their allium cousins the onion and garlic, leeks add wonderful flavor to foods, but can also star on their own. 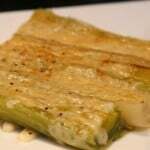 This leek gratin makes a great side dish to just about any dinner. I originally found a recipe in a Williams and Sonoma recipe book and decided to make it for a family dinner where we hosted the Kitchen Stewardship family. Knowing Katie, I knew we’d have at least 2 people who would be up for trying something new. Her and I. (our families aren’t quite as adventurous as we are!) Her husband was a delight and real trooper when he selected just one for his plate. You always know someone is hesitant when they take only one!!! My husband on the other hand…..didn’t even take one. Stinker. Ahhh….but we were all delightfully surprised at how amazing they really were! I made my husband try a bite of mine and he actually got up to get some more of his own. Wash leeks thoroughly to remove all dirt. Slice in half vertically down the leek. Lay leeks cut side up and pour stock over them. Bake at 350, covered with foil (I take a cookie sheet and put it over the pan) for about 30 minutes. Sprinkle cheeses over top, dot with butter. Place under the broiler until the top is golden brown, 2-3 min. I have to admit I’ve been a little intimidated by cooking with leeks before as I really had no idea what to do with them. However, this recipe looks delicious and totally do-able. I will definitely be trying it! I made these last night. They were absolutely wonderful! I wish I had more leeks to make this again. Thanks for the recipe!